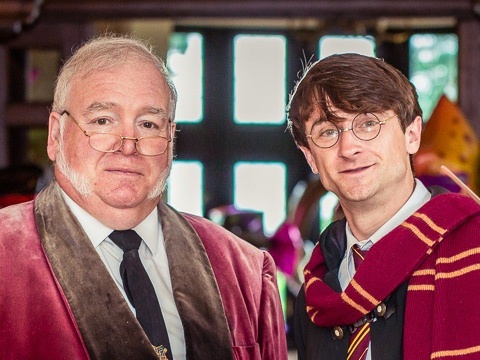 TREAT YOUR YOUNG WITCH OR WIZARD TO A HARRY POTTER PARTY WITH THE PROFESSOR AND OUR HARRY POTTER LOOKALIKE ….AS SEEN ON THE CHANNEL 4 COMEDY SERIES “LOOKALIKES” …. PLUS PRIZES FROM THE UK AND AMERICA! 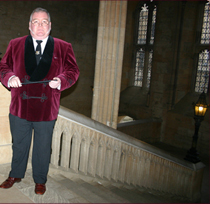 If you’re planning a birthday or special occasion, let our professor take care of your entertainment with a swish of his wand! Be sure to bring a camera as he really does look the part with genuine lamb chop whiskers & glasses perched on the end of his nose! Mums and Dads can sit back, relax & enjoy a tipple or two of their favourite “potions” as the boys & girls join in all the fun of their first magic lesson performed by professional members of Actors Equity who are also members of the prestigious Magic Circle, followed by games, competitions with wizarding prizes followed by a harmless “Battle for the Battlements” with balloon swords & a junior disco to finish! Be sure to check out the reviews that our parties have received on the Daily Prophet page…. it’s well worth a look! As the Professor would say ….. cool !